What people are saying about Erin. 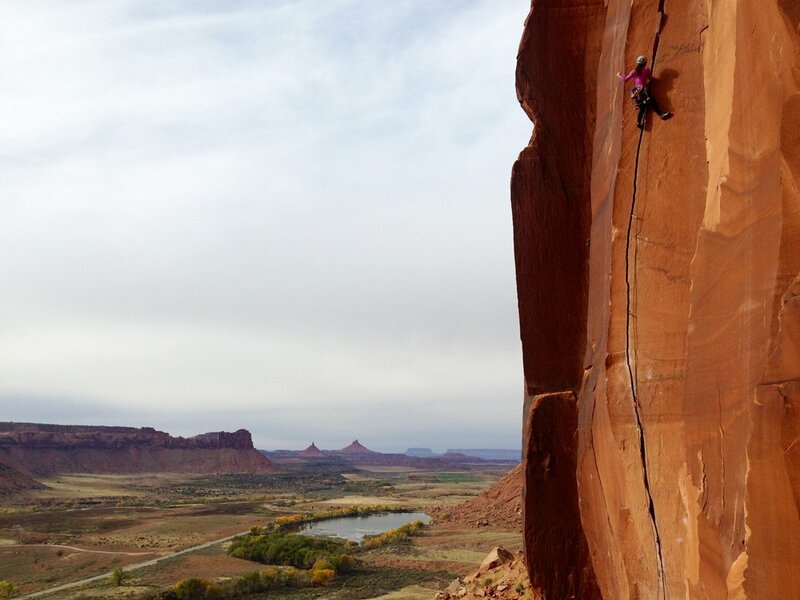 Erin climbing in Indian Creek, Utah, traditional territory of Navajo, Hopi, Zuni, Ute Mountain Ute, & Uintah Ouray Ute. "I did a lead class with Erin and I was challenged to think about how I think of climbing. As someone who isn’t the most confident lead climber, Erin helped with that. She showed me new ways to clip and the correct ways to correct my brain. As a human who lives a pretty positive lifestyle, her talk about applying those positive mantras really applied to my climbing. Erin not only helped my climbing, but to better assess my climbing partners in complete acceptance. I recommend Erin to anyone who wants to challenge their mental touchiness or practice their climbing techniques. As an instructor she is full of acceptance and knowledge." Erin climbing at Ozone, local crag in Portland, Oregon, traditional territory of Multnomah, Chinook, Kathlamet, Clackamas, Tualatin Kalapuya, and Molalla peoples. "I did a lead climb training session with Erin and was challenged to think about climbing in a new way that helped me feel more connected to myself and my body. Erin not only showed us techniques on how to become better climbers, but she taught us how to engage with ourselves using compassion and acceptance to adapt with the adversity that we can face while climbing. I recommend anyone interested in gaining a stronger and more confident mindset to work with Erin."